10 Facts About the Panagia of "Axion Estin"
An Interpretation of the Name "JOHN"
At the St. Anthony's Monastery in Florence, AZ, a 27 year-old novice monk took his life with a gun on the dawn of June 11. Scott Nevins was a novice for six years at St. Anthony, one of the 21 Monasteries established by Elder Ephraim, the former abbot of the Philotheou Monastery on Mount Athos. From Modesto, CA Nevins was a convert to Orthodoxy. He had left the Monastery 15 months ago in the middle of the night and went to Oregon and enrolled in college. He returned the Monastery armed with two guns and a knife on June 10. When he pulled into the Monastery parking lot he was met by a night watchman monk. He drove a short distance away. The watchman drove his car toward the area where Nevins had parked. At some point, Nevins shot himself according to police accounts, and was flown by a helicopter to an area hospital, where he died. An autopsy was scheduled to be performed. The Monastery belongs ecclesiastically and canonically to the Greek Orthodox Archdiocese of America through the Metropolis of San Francisco under Metropolitan Gerasimos. TNH was unable to reach Archbishop Demetrios or Nevins' parents for comment. The authorities have not established a motive why Nevins took his life or why he returned to the Monastery armed with two guns and a knife. In e-mails that he exchanged with Abbot Paisios and another monk, Fr. Ilarion, Nevins wrote that he had been threatened by other monks including elder Ephraim whom he described as "charlatan." When he quickly left the Monastery 15 months earlier, Nevins had left his oral retainer behind, among other personal items. He had requested that the Monastery retrieve it, but the monk who cleaned his room had thrown it away. Nevins insisted to be reimbursed $4,000 for it, but the Monastery offered to send him to an orthodontist in California and to pay to replace it; Nevins refused. Nevins sent an email to Ilarion stating among other things that "you have to pay for the retainer. I am calling the sheriff if you don't and getting a lawyer." He also wrote that "I had to leave in a hurry, and I forgot my retainer. I had to leave because of the immediate threat to my personal safety. A number of the fathers, including the elder were after me, and a threat against my life was made. Did you even ask elder Ephraim if he had threatened me? Oh, no, you just know these things without having to ask." In another email to Ilarion, Nevins wrote that "elder Ephraim is a charlatan, he's lying about being holy and being a good person. When I discovered this, he threatened me and I had to leave immediately, in the middle of the night, which is why my retainers and baptismal certificate were left behind." Ilarion replied to Nevins that "please note that on the day you left here we were really concerned about your whereabouts and safety, so I called the Sheriff's office and filed a missing person report because you didn't leave a note nor did you inform anyone. Later that night the Sheriff's office called and informed me that they spoke to your father/mother and that you left here for good. The Sheriff's deputy said you went to a friend's house. The morning you left, you were seen going to church, getting the elder's blessing and walking out the front gate around Liturgy time 3AM holding a small bag. No one thought anything at the time, but they told me about it a day or two later." Ilarion also wrote to Nevins that "the elder has never threatened anyone who wanted to leave here. All who come here as novices or guests come of their own free will and leave of their own free will. No one is forced to be here and all monks and novices have access to a telephone." Nevins replied to Ilarion: "the elder has never threatened anyone" uhhh…you live in a fantasy world. I didn't ask you for your opinion as to why I left the way I did; actually Fr. Paisios told me that I was to leave with nothing. Absolutely nothing; so, I did. I didn't have a bag in my hand. And another thing, your Elder Ephraim is a complete charlatan! He isn't holy at all! Not at all! He is lying about everything. The deception is unbelievable." At some point Nevins appeared very angry and he threatened Ilarion and also Elder Ephraim and used inappropriate language. On April 20 he wrote to Ilarion: "hey worthless, deadbeat, loser, give a direct phone number to the All Holy and Thrice Blessed Eminent and Despotic Elder of the Monastery, so that I can tell the person in charge what I really think about Your All Worthlessness! I truly feel like ripping your face off of your skull! I don't know what to do, dumba**. Help me! Hey, …s**t-head, ask The All Holy Elder Ephraim if he feels like having every tooth beaten out of his Skull, because that's how I feel". Passios told TNH "that the young man was not progressing here and I told him if he wanted to go back home and do something with his life." As to why Nevins left, Paisios said "he simply couldn't stay here. He wasn't telling me many things. We were talking frequently but he was not telling me the reasons that he wanted to stay here." Paisios is convinced that Nevins "came to the Monastery to kill us and then take his own life." Paisios said that during most of the time that Nevins was a novice "he did not show any signs [of peculiar behavior]. A year before he left he was in contact with some people who were acquaintances and friends and he had some concerns. I remember one time he had said to me that the white flowers in the oleanders in the Monastery's garden is the symbol of Satanists". If the Monastery notified his parents when they saw the signs that something had changed on Nevins, Paisios said "we did not have a connection because they were saying that we had stolen their child, that we had brainwashed him." Speaking about Nevins' allegations that elder Ephraim had threatened him, Paisios said "all these were in his fantasy" and he added that "Fr. Ephraim doesn't threat nor has any intent to threat anybody." Paisios added that Nevins "did not have any contact with the Elder who does not speak English and Scott did not speak Greek." Paisios said that the Monastery checks prospective monks' past to determine whether they have ever taken antidepressant drugs, at which point it does not admit them. He refuted the possibility that the Monastery watchman could have killed Nevins, maintaining that the police confirmed that Nevins had taken his own life. According to Paisios, the Monastery has 39 monks and 6 novices, 45 in total. It was built in 1995 and Paisios said "it cost 8 to 9 million dollars, which came from donations." He denied that abbot Ephraim from the Vatopedi Monastery of Mt. Athos has given money to the Monasteries built and controlled by Fr. Ephraim's of Arizona. "No, no, how do these things circulate," Paisios said. When he was reminded about the official news announcement issued by the Vatopedi Monastery on October 9, 2008 that $2 million was given as assistance to various causes including "in ecclesiastical institutions and Monasteries in America and many Eparchies of the Ecumenical Patriarchate" Paisios said "we have never asked and we have never been offered [money]." Paisios attributed how all these 21 Monasteries were established throughout the Archdiocese within only a few years "as a miracle" and added "we do not do anything secretive [and we have not] received any funds from Vatopedi. These [rumors] are baseless." The responsibility we share as the ordained ministers of the Holy Gospel is a sacred trust bestowed upon us by Holy Ordination. Our ministry is replete with joy and sorrow that we experience with the people of God entrusted to our spiritual care. It is, therefore, my paternal obligation to inform you of a tragic event that has occurred within the boundaries of our Holy Metropolis. 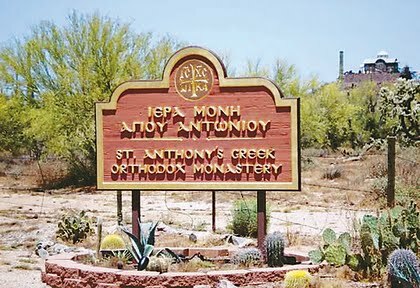 A young man who had come to our Faith and became a novice at the Holy Monastery of St. Anthony the Great, and subsequently left the Monastery for unknown reasons last year, took his life last Monday morning at approximately 2:45AM. Scott Nevins, 27 years old, had spent six years at St. Anthony's. Last year, after leaving the Monastery he enrolled in a college in Oregon. In the early hours of last Monday morning, Scott took his life in an area near the monastery. The proper authorities are investigating this incident and we will cooperate in every way necessary. In addition, the Metropolis is conducting an investigation into this matter. On behalf of the Holy Metropolis of San Francisco we wish to extend our prayers and love to the Nevins family. May Christ Jesus, our Lord, God and Savior look with mercy upon the soul of his departed servant. Eternal be his memory!